Beka Business Media, publishers of outdoor specialty trade publication Inside Outdoor, this week officially launched its IO TV video channel. This new YouTube channel adds video to Inside Outdoor‘s omni-channel B2B platform, which provides subscribers and partners with access to information and marketing via print, online, emails blasts, webinars, social media, digital content creation, now video and more. 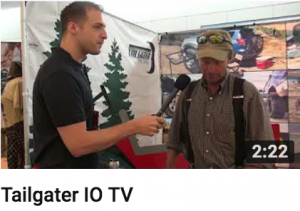 Inside Outdoor’s IO TV will be roaming the aisles of upcoming industry trade shows, holding interviews with influential innovators and video demoing the latest and greatest in new products, components and designs. For its launch, IO TV visited the booths of more than a dozen outdoor industry brands that exhibited at the recent Outdoor Retailer Summer Market in Denver. Colo. The channel currently hosts video demos from leading outdoor brands including CORDURA, Nikwax, Body Glove, Katadyn, Gateway Trade Funding, Thermacell, Amfit and Centric Software, among others.